The negotiations were only concluded before midnight on March 24th You can access the document HERE If you listen to the statement of the various member states you will get hints as to the stumbling blocks. Saudi Arabia was the first to make a statement followed by the US, the EU, Egypt, Yemen, Mexico, Sudan, Trinidad and Tobago, Turkey, Canada, Iran, Colombia, Mauritania, and the Holy See. This team presented a parallel event entitled ‘Economic Empowerment Strategies Addressing Systemic Issues affecting Girls and Women’ from Taiwan, to the Democratic Republic of Congo to Bolivia. From the Agreed Conclusion paragraph 16 “The Commission…emphasizes that no country has fully achieved gender equality and the empowerment of women and girls, that significant levels of inequality between women and men, girls and boys persist globally, and that many women and girls experience vulnerability and marginalization owing to, inter alia, multiple and intersecting forms of discrimination throughout the lifecycle. The Agreed Conclusion “Women’s empowerment and its link to sustainable development” are captured here in a piece of art work submitted by Monique Tarabeth to NGOCSW Committee for the cover of the Handbook 2016. We were not selected for the cover but were a divider inside the book. Thanks Monique! Apart form the cover the other art pieces were in black and white. Beautiful expressions of empowerment! 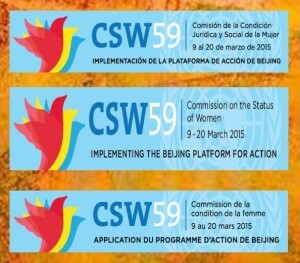 The Good Shepherd Statement to the Commission on the Status of Women (with the main focus on Beijing Declaration and Platform for Action), has been published in the 6 languages of the United Nations. The following NGO’s at the UN supported the statement – Dominican Leadership Conference, International Federation of Women in Legal Careers, International Federation of Women Lawyers, International Presentation Association of the Sisters of the Presentation of the Blessed Virgin Mary, Passionists International, Religious of the Sacred Heart Mary, Society of Catholic Medical Missionaries, Sisters of Mercy of the Americas, and UNANIMA International. “Today, the various Good Shepherd grass-roots services work with women and girls in 72 countries who are constrained by situations that are the same, or often worse, than those that existed in 1995. 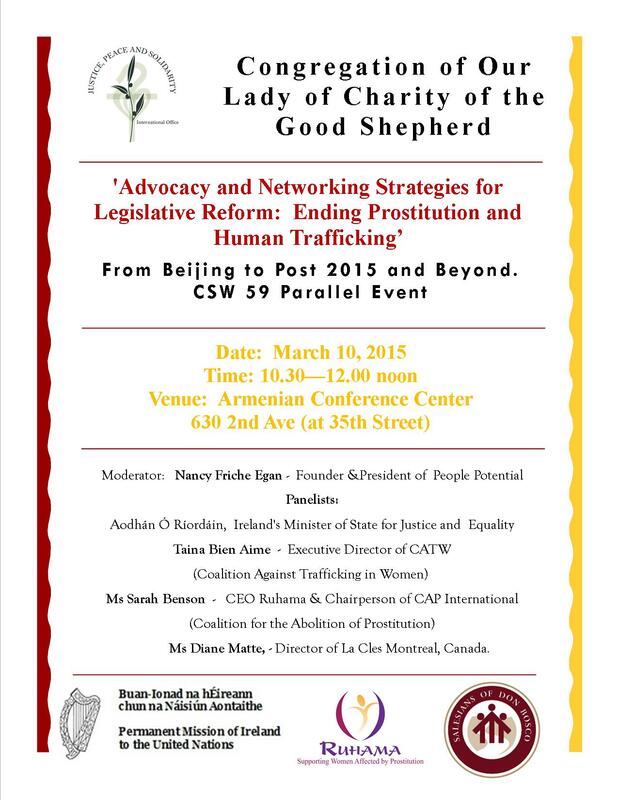 Under the current model of economic globalization, women and girls who are living in extreme poverty and denied access to basic services are highly susceptible to forces of irregular migration, prostitution, and trafficking for sexual and /or labour exploitation. We are particularly happy that the Permanent Mission of Ireland to the United Nations supports the event and that Ireland’s Minister of State for Justice and Equality, Aodhán Ó Ríordáin will be present. He may not be able to stay for the whole event but we look forward to welcoming and hearing from him. See the flyer for information. ​”We applaud the Member States that have ratified and begun to adopt these international laws at the national level. We acknowledge and appreciate the many regional mechanisms and agreements that are in place. But only when each country has integrated the international laws into national laws and collaborates across borders to ensure the human rights of every person will change be seen. NILS research report wins award second year in a row! The Impact Measurement Awards are part of the Annual Measuring Social Outcomes Conference which provides practical guidance on progressing outcomes measurement.